JAMMU, MARCH 09: Advisor to Governor, K Vijay Kumar today laid foundation of various developmental projects of Hospitality & Protocol and Estates Departments involving an amount of Rs 25.88 crore. These projects include construction of additional blocks at Circuit House, Canal Road Jammu and Circuit House at Church Lane Sonwar in Srinagar, construction of additional block at State Guest House Jammu and construction of residential accommodation for state government employees at Ghulami Bagh, Canal Road Jammu. Principal Secretary Planning, Estates, Hospitality & Protocol, Rohit Kansal, Director Estates, Tariq Hussain Ganai, Director Hospitality & Protocol Tariq Ahmad Zargar, Chief Engineer PWD D K Khanna, Superintending Engineer PWD N D Khwaja, Joint Director H&P, other senior officers and staff of Estates and H&P department were present during the foundation laying ceremony. At Ghulami Bagh, Canal Road Jammu, the Advisor laid the foundation for construction of residential accommodation of Estates Department. Under this project, construction of additional residential accommodation has been proposed to provide the accommodation to the officers and other employees of the state government. The Advisor was briefed about the project by the engineers of concerned executing agency and it was informed that as part of its expansion programme, the Estates department has proposed the construction of additional housing units at an estimated cost of Rs 9.6 crore by utilizing 6.57 kanals of available land in possession of the department. 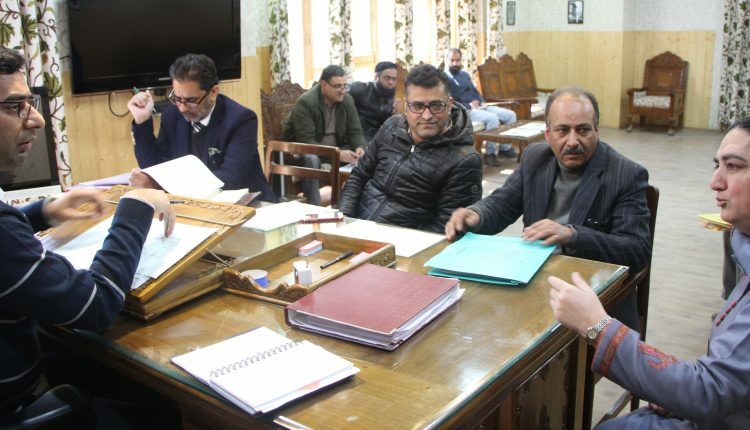 He was further informed that the Estates department has undertaken a massive up-gradation and expansion programme where a number of additional units are under construction for non-gazetted employees both at Jammu and Srinagar. These include 32 new residential units at Sarwal, 48 at Muthi besides new blocks for move employees at Ahata Amar Singh and Pampore in Srinagar.Meanwhile, the Advisor also laid the foundation of additional blocks in Circuit House Jammu and VVIP accommodation at State Guest House, Canal Road Jammu for Hospitality & Protocol department. Both the projects have been proposed to augment its infrastructure and to accommodate the Guests and VIPs visiting the winter capital of the state. The additional block at State Guest House Jammu to be constructed at an estimated cost of Rs 1.15 crore having 08 VVIP Suites and a Conference Hall while as additional block of 3-storey building at Circuit House Jammu would be constructed at an estimated cost of Rs 6.65 crore to have 20 more rooms in this new block. The Advisor while getting briefs about these projects, asked the engineers to save as much of standing trees from cutting them down while executing the projects as they add to the beauty of the area. He also asked the executing agency to complete the projects within given timeframe ensuring quality material to be used for the construction and other allied works. In order to take appraisal of the facilities available at Circuit House Jammu, K Vijay Kumar inspected the VIP Suites, Rooms, Dinning and Kitchen area. He also interacted with the kitchen and other staff and sought their suggestions for further upgrading the facilities. Later, the Advisor along with Principal Secretary P&M and other senior officers visited Convention Centre Jammu where laid e-foundation of additional block for H&P department at Circuit House, Church Lane in Srinagar. This project would be completed at an estimated cost of Rs 9.02 crore. On completion, 56 rooms including 30 Suites would be added to the infrastructure of H&P department in summer capital of the state, the Advisor was informed.